﻿ Notice: Undefined index: idsek in /var/www/vnews/htdocs/index.php on line 33 Notice: Undefined variable: pismo in /var/www/vnews/htdocs/index.php on line 59 Notice: Undefined variable: postrani in /var/www/vnews/htdocs/index.php on line 76 Notice: Undefined index: postrani in /var/www/vnews/htdocs/index.php on line 77 Notice: Undefined index: postrani in /var/www/vnews/htdocs/index.php on line 77 Notice: Undefined property: Novosti::$osPortal in /var/www/vnews/htdocs/lib/Novosti.class.php on line 977 Notice: Undefined property: Novosti::$osPortal in /var/www/vnews/htdocs/lib/Novosti.class.php on line 1005 Notice: Undefined variable: idesek in /var/www/vnews/htdocs/sadrzajmodula.php on line 7 Notice: Undefined variable: sirokiSablon in /var/www/vnews/htdocs/index.php on line 140 Tunisia: A success story? Three years to the day since the ex-president Zine al-Abidine Ben Ali fled Tunisia, the country is doing much better than others that witnessed an Arab awakening in 2011, providing some hope for people in the Middle East and North Africa. 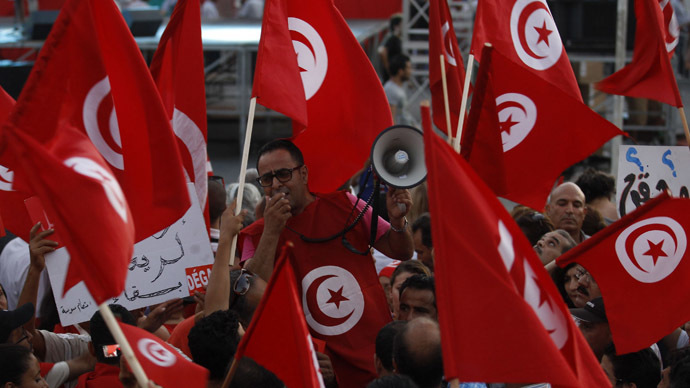 On January 26, Tunisia - the first country to undergo an Arab Spring revolution - approved a new constitution, marking a historic event in the process of democratization. Tunisia's new constitution and relative political progress contrast sharply with messy transitions in other Middle East states, which are still caught up in turmoil. In Egypt, the army toppled the first elected civilian president, regaining power behind the veil of a civilian government and approving quite a controversial constitution, which throws Egypt back to Hosni Mubarak’s time. In Libya, two years after murder of Muammar Gaddafi, the country still suffers a rise of violent groups alongside regional and tribal divisions, while the congress is deadlocked between Islamists and a nationalist party over the route for transition, and the constitution is still undrafted. Syria has fallen into complete chaos between the rule of Bashar Assad and anti-government rebels, with the mobilization of Al-Qaeda and other affiliated radicals. Yemen has sunk into a cycle of tribal and sectarian conflicts, the expansion of Al-Qaeda and a rise in the dangers of division between north and south. Against this dark background, Tunisia, the cradle of the Arab revolutions, seems to be a lucky exception. The first result of the Tunisian (Jasmine) revolution was the ouster of President Ben Ali in a rather short period of time. Then on October 23, 2011, the first free elections were held and Tunisia embarked on a promising democratic transition. The elections were won by the moderate Islamist Ennahda Party, which forged an alliance with two moderate secular parties, the Congress for the Republic and the Ettakattol Party. According to the statements of the ruling ‘troika’, the coalition government coexisted in harmony, participated with the opposition in conferences for national dialogue, and reached consensus in terms of the charter’s content. However, the opposition’s calls to bring down the government and dissolve the National Constituent Assembly (NCA) were still heard. The renewal of protests in 2012 was pushed by opposition’s accusations of Ennahda Party for going easy on hard-line Islamists, who promoted the idea of an Islamic state based on strict Sharia law. In addition, though the Tunisian army has never played any active role in the revolution and refrained from intervening into political process, the appointment of several militants to key administrative posts seemed alarming to the community. Moreover, Ennahda was condemned for tolerating the violent reactions of the Salafists to some Tunisian cultural events. Ennahda accused the opposition of conspiring with the remains of Ben Ali’s regime and trying to prevent modern political Islamists from succeeding in the government. Soon the political situation was destabilized by two political assassinations with radical Islamists believed to be behind them. The assassination of Chokri Belaid, a far-left politician, brought down Islamist Prime Minister Hamadi Jebali and pushed the ruling coalition to make a government reshuffle and relinquish the foreign, interior and justice ministries to independent ministers, which helped to stabilize the internal situation. However, the second political assassination on July 25, 2013, of Mohamed Brahmi, the secretary-general of Tunisia’s People’s Movement party, a few weeks after the military coup in Egypt, and the subsequent deepening of political polarization between the ‘troika’ parties and the opposition, alongside the rising security threats from neighboring Libya, dragged Tunisia into a new political crisis after months of relative calm. Nevertheless, Ennahda’s leadership has shown wisdom and willingness to compromise. After months of protests and deadlock, Ennahda agreed to step aside for a caretaker neutral technocratic government that would govern until elections. Thus, Tunisian politicians have opted for compromise rather than zero-sum politics. Ennahda's voluntary exit from power allows it to go into the next polls claiming to have put the country’s stability ahead of its narrow party interests, which has never been done in Egypt, for example. During December’s round of talks between the country's political parties, Industry Minister Mehdi Jomaa was picked for premiership. He became the fifth prime minister to be appointed since the Jasmine Revolution. Jomaa was responsible for naming a caretaker government to lead the country until elections, however, a consensus over the key post of interior minister hasn’t been reached and the PM had to postpone his decision. "I have to inform the president that I do not have the list. It is not a question of a person, but rather I am looking for a real consensus in the government. There should not be any division," he said on January 26. On January 29, Jomaa appointed a caretaker cabinet as part of a deal to end a crisis between Tunisia's Islamist party and its secular opposition until new elections this year. The proposed line-up was approved by 149 politicians, with 20 voting against and 24 abstaining. Three days before the formation of the new government the most crucial step to getting the democratic transition back on track was made – the new Constitution was approved. It took a bit more than two years for the elected representatives in Tunisia to complete the drafting of the new charter. Though the drafting wasn’t always easy and the NCA plenary sessions weren’t smooth, the Tunisian Constitution has turned out to be the most progressive in comparison with those of other Arab states. Islam is not mentioned as a source of legislation, although it is recognized as the nation's religion and the state is committed to “prohibiting any attacks on the sacred,” while freedom of conscience is guaranteed. It also guarantees equal rights for men and women and commits the Tunisian state to working towards equal representation of women in all elected bodies. This is an unprecedented measure in the Arab world. However, there has been some criticism concerning several restrictions on freedom of speech and on the fact that the constitution has not abolished the death penalty. Nevertheless, the document appears revolutionary for the region, which means that democratic institutions have a good chance of taking root in Tunisia. Before signing the document, Tunisian President Moncef Marzouki said that “With the birth of this text, we confirm our victory over dictatorship.” He added that much work remains to make the values of the constitution a part of the Tunisian culture and normalize the situation in the country. All in all, new constitution and formation of the caretaker cabinet means that Tunisia may, after all, embark on the path to democracy. In 2014 the country is planning to hold presidential and parliamentary elections, though the dates haven’t been scheduled yet. Despite the evident progress in terms of politics, economically, things are only getting worse. In 2012 the Tunisian economy kind of recovered, with GDP growing by 3.3 percent, but this was insufficient to respond to the country’s main challenges: unemployment (especially among youth), high current-account and budget deficits, and regional disparities. In July 2013 the unemployment rate reached 16.5 percent, whereas before revolution it was at a steady 13 percent. At the same time the inflation rate was 6.5 percent, though, according to the Tunisian Central Bank, this indicator should decrease to 6.1 percent in January-February 2014. The Tunisian government gambles on relative recovery in tourism, good agricultural season, foreign direct investment and Tunisian hydrocarbon and phosphate production as the main growth stimulators. At the moment tourism represents about 7 percent of Tunisia’s GDP and supports 400,000 jobs. However, the industry has yet to return to its pre-revolution level. As to natural resources, in order to expand exports of phosphate, the public corporation Groupe Chimique Tunisien (GCT) involved in international co-operation projects with partners from India (Tunisian Indian Fertilizers, Tifert) and China. This would stimulate the economy and industry, as well as increase trade volumes. While GDP growth is estimated to reach 4.6 percent in 2014, abject poverty remains epidemic in the country’s interior and public spending has recently increased. After the approval of the new constitution daily protests swept the country from north to south. Frustrated by a new tax increase alongside rising food prices, demonstrators attacked government buildings, blocked roads, and ransacked the headquarters of the ruling political parties. According to recent polls conducted by Transparency International and Tunisian market research firm 3C Etudes, 35 percent of Tunisians regret the downfall of Ben Ali, explaining this by an uncertain future and existing problems - for instance, the deteriorating security situation and unemployment. Around 60 percent of respondents cited the shrinking purchasing power. Eighty percent of Tunisians believe the country has become more corrupt. In general, many people said that they would have preferred to live under dictator’s regime, which was bad but stable, rather than trying to build democracy with no confidence in the future. Therefore, to keep the democratic process on track, the Tunisian authorities have to improve Tunisians’ quality of life. Rises in taxes, poor infrastructure and health services, high unemployment, increasing food prices, budget deficit and corruption – all these can trigger unrest and lead to a second Jasmine Revolution. All in all, Tunisia may indeed give hope for other people in the region and demonstrate that it is possible to get rid of longstanding repression and fear and stand on democratic route without unnecessary violence, resolving emerging conflicts through dialogue and compromise.